Cornbread should be sweet. I’ve picked my side and it’s clearly north of the Mason-Dixon line. I am from Canada, after all, so I guess my northern roots go pretty deep. Of course, “sweet” is always a relative term, whether you’re referring to cornbread, animals or people. This cornbread lives perfectly in the middle between unsweetened and “so sweet it could double as birthday cake” sweet. It’s just sweet enough and that’s why I like it. If you’re a cornbread expert you’ll notice the ingredients that make this recipe Yankee through and through. Of course there are regional exceptions, but traditionally, southern cornbread contains no flour and is not sweet. On the flip-side, northern (or Yankee) cornbread has both flour and sugar. It has a more cake-like texture, with a fine, airy crumb, and varying levels of sweetness depending on the recipe. Mix the wet ingredients in one bowl and the dry in another. Add the two together and mix but don’t over mix. Here’s where the recipe gets a little wacky but in a good way. 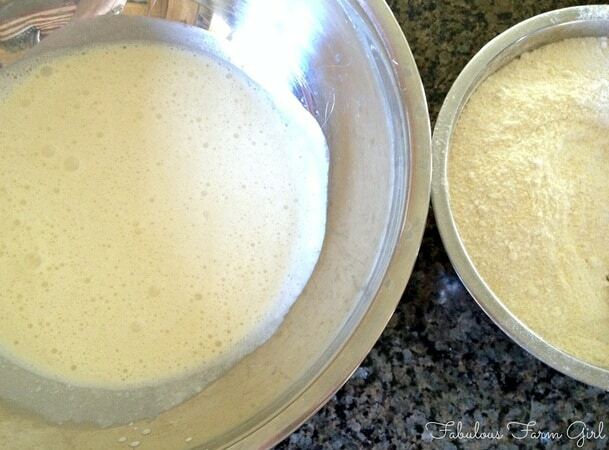 Beat the eggs whites until stiff, then gently fold them into the wet mixture until just combined. I need to point out that the perfectly stiffened egg whites were previously frozen. They beat into stiff peaks, no problem. The egg yolks in the recipe were also previously frozen (separately) and also worked fine. To learn how to freeze eggs you can visit my post titled, what else, How To Freeze Eggs. 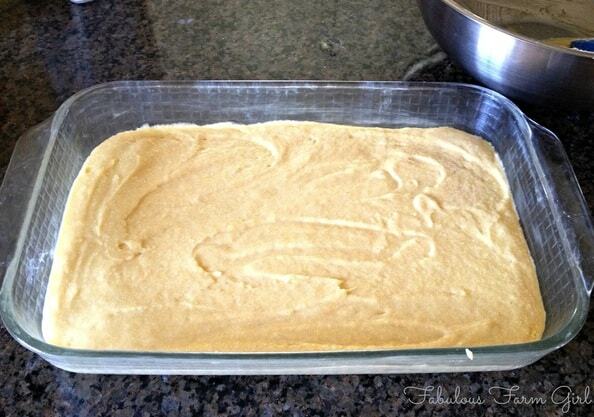 Spread batter into a well-greased 9″ x 13″ pan and bake. What I love about this cornbread recipe is that it’s sweet enough to be eaten on its own with just a little smear of butter. But it isn’t so sweet that you can’t add a little honey-butter for a truly decadent treat. This cornbread is the perfect accompaniment to tender B-B-Q ribs, tangy baked beans or smokey chili. My kids think the leftovers make a terrific breakfast too. Enjoy! Preheat oven to 350 F. Generously grease a 9″ x 13″ pan. Separate eggs into two small bowls, one for yolks and one for whites. 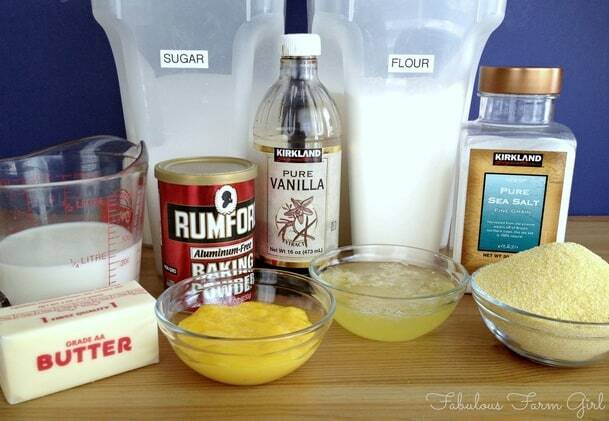 In a large bowl mix cornmeal, flour, sugar, baking powder and salt. In a separate bowl, add egg yolks, milk, vanilla and butter. Mix until combined. Add egg mixture to flour mixture and mix until just barely incorporated. In a mixer beat egg whites until they form stiff peaks. Add to batter and fold in gently until just combined. Pour batter into prepared pan and spread with spatula. Bake for 25-30 minutes or until top is golden brown and toothpick comes out clean. Serve warm. Note: These freeze really well. I like to cut the extra into serving-size pieces and freeze on a cookie sheet. Once frozen, remove from cookie sheet, place in gallon ziplock bag and return to freezer. 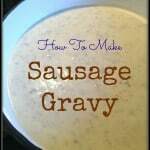 This recipe is adapted from the Thrive website. It’s a great one-stop shop for all your emergency preparedness and food storage needs. In a large bowl mix cornmeal, flour, sugar, baking powder and salt. In a separate bowl, add egg yolks, milk, vanilla and butter. Mix until combined. Add egg mixture to flour mixture and mix until just barely incorporated. 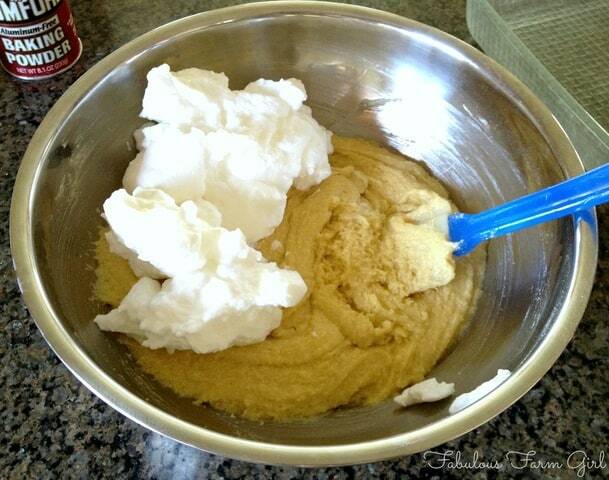 In a mixer beat egg whites until they form stiff peaks. Add to batter and fold in gently until just combined. Pour batter into prepared pan and spread with spatula. Bake for 25-30 minutes or until top is golden brown and toothpick comes out clean. This cornbread freezes really well. I like to cut the extra into serving-size pieces and freeze on a cookie sheet. Once frozen, remove from cookie sheet, place in gallon ziplock bag and return to freezer. This was so delicious. 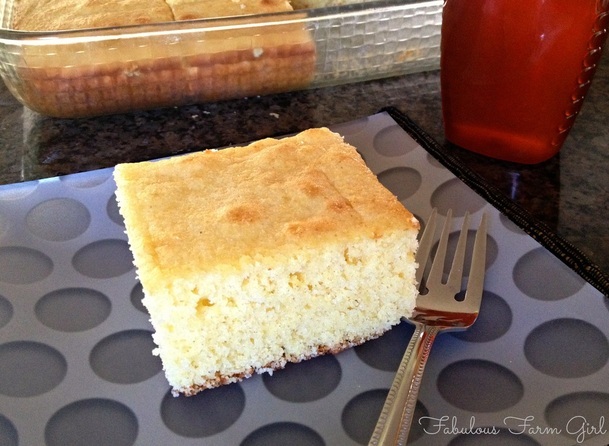 As a fan of all cornbread, I’ve been looking for the perfect sweet version and this is it. Cakey, crumbly, moist, and almost sweet enough to frost. Thank you! Wow Mike–your comment made my day! So glad you like it as much as I do. Have a fabulous week and come back soon. Wow…this looks great! 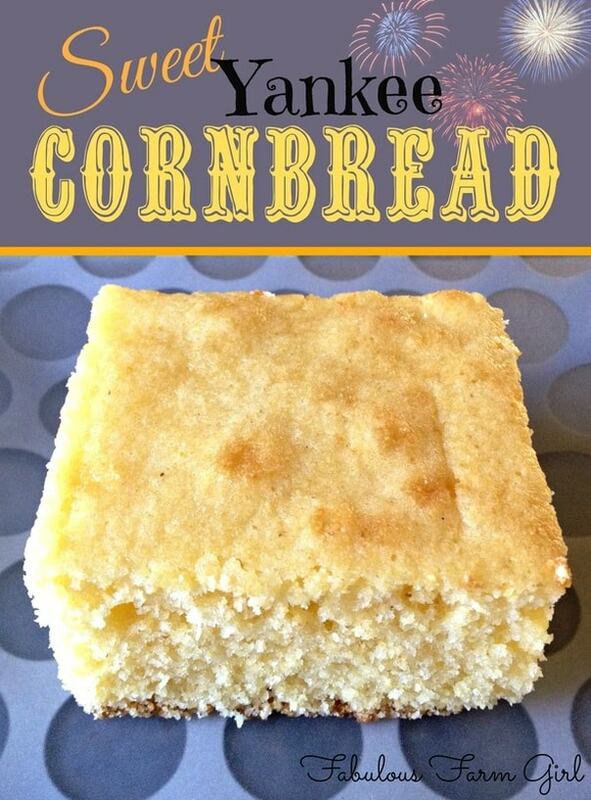 I love cornbread…and tis the season for sure! Pinning! Thanks Kim! 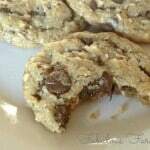 This is the best recipe I’ve ever found and I’ve tried a lot of recipes. Enjoy! It was news to me too Teresa! Down in the south, where they take their cornbread very seriously, they wouldn’t consider what I make to even be cornbread. They would call it corn cake but that sounds like a dessert to me and eating it for dinner would just induce guilt. LOL! Yankee cornbread, on the other hand, is guilt free and absolutely delicious. Enjoy! This is so true! I am from PA and when we moved to SC and tried southern cornbread for the first time I was so disappointed. Corn bread should be sweet and moist not dry and tasteless! Hi Tracy–thanks for stopping by. Don’t tell my southern friends but I totally agree! They do fabulous things with shellfish in South Carolina so hopefully that made up for the cornbread. LOL! Have a fabulous week!